Beauty Therapists have become an essential part of our lives with both men and women alike relying on them to make us feel and look great. As they’ve become increasingly popular, many salons will be fully booked and the therapist will undertake numerous treatments daily with a number of different clients. It could be the worker popping in a lunch time for a quick manicure to the holiday maker coming in for a full body wax treatment! There’s a strict time keeping policy that many follow to ensure that they stick to treating clients within their specified time or there will be a knock on effect with other customers who are due in. As a result of this, therapists will either end up working longer hours or shorten their breaks and lunch hours to make sure their customer is a priority. It’s important for you to be aware that this role isn’t easy or relaxing, and in fact requires a lot of personal skills to be successful including being able to work long and sometimes unsociable hours, carry out different beauty treatments and be able to work on your feet all day. In last week’s post, we looked at the qualifications that are required in order for you to become a beauty therapist. But to give you a real insight into the beauty world, we’ve teamed up with local salons to show you what a real beauty therapists day looks like. The hours that are worked as a beauty therapist can vary across different salons. The usual hours are between 9am- 6pm and most include working on Saturdays. Usually, there’s an evening a week that is open later which you might be required to work. If there are seasonal events such as Easter, Christmas or New Year, you’ll be expected to be working as many people will be getting pampered for nights out to celebrate these occasions. Bank Holidays are also required for you to work as many people are off work and wanting to socialise. These hours are subject to change depending on salon and holidays. As this line of work is needed for big occasions and weekends, you may find yourself working unsociable hours as this is when you are most in demand. However, if you are self employed or mobile, you do have the freedom to work hours that you to fit your lifestyle but the hours will remain similar as working in a salon. What are the day to day treatments as a beauty therapist? Beauty Therapists undertake a number of different treatments for client on a daily basis. It’s great as it allows your day to be filled with a range of activities for you to get stuck into which will break up the day. When you first start your day, you will have to prepare the salon to ensure all equipment is ready for when your client arrives. Perhaps you will turn on the wax pots and heaters, do a quick check of the stock and ensure there are wax strips ready for treatments. Clients’ treatments vary- for some you might be carrying on one but for others you may be completing 3 or 4! Some of the more common treatments that you’ll probably find yourself working on will include waxing on the legs, bikini and brows, tanning, makeup application, manicures and pedicures, facials and massages- depending if your Salon offers this treatment. What will I be doing when I’m not treating clients? When you are not undertaking beauty treatments, you will be responsible for maintaining the salon or spa you are working in. You’ll be answering the phones to customers, taking messages and booking clients into appointments, meeting and greeting clients, ensuring there are enough supplies, cleaning the salon to make sure it’s in good condition for clients and making sure there’s clean towels for clients for massages and nail treatments. You may also cash up at the end of the day. Most salons do have a uniform in place but colours and styles vary across. It saves having your own clothes covered in dye and wax! Make sure you check back next week for our blog which focuses on how much you can earn as a beauty therapist. Share with us what your working day looks like! 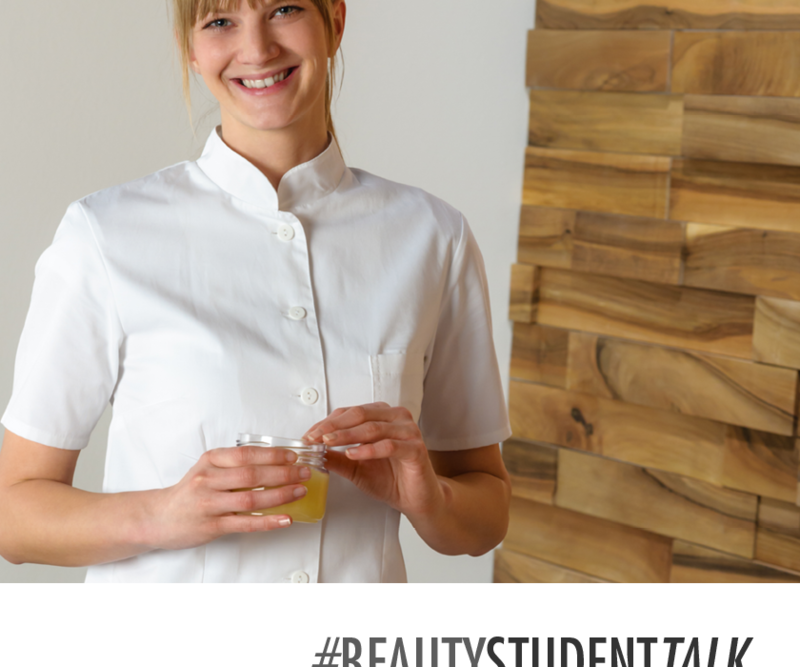 Also, visit our Facebook and Twitter page for our #BeautyStudentTalk hashtag for more useful hints and tips for your career as a beauty therapist.